Jameson is my miracle baby. I’d already had 5 miscarriages and Jameson was a complete surprise. I never expected to stay pregnant with him, I kept waiting for a miscarriage or something to go wrong. It was very hard for me to stay positive about the pregnancy or even connect with Jameson. Because of my history with miscarriages, I was monitored very closely. I had ultrasounds every 2 weeks. Things were looking great! He was growing like he should and his heartbeat was amazing. The most magical sound in the world. My dr had no concerns. I was offered the Panorama test even though my dr thought things were fine. I am 40. I decided to do the testing because it would also tell me gender. That’s what I really wanted to know! The test came back with a 9/10 chance of T18. Funnily enough, they didn’t tell me gender! I was 12 weeks pregnant. I decided to do the CVS test to get confirmation. It came back positive. My dr encouraged termination of the pregnancy and told me if I continued with the pregnancy I would be delivering a stillborn baby by 19 weeks of my pregnancy. There is no way I could terminate when Jameson had such a beautiful heartbeat. I decided to continue with the pregnancy. I was watched more closely by my drs. I had an early anatomy scan that showed a possible VSD. I went back 2 weeks later and the significant VSD was confirmed. Jameson also had a 2 vessel cord. Everything else seemed fine. This was the first appt where drs were positive and talked about interventions we would do after Jameson was born. I was thrilled! I even got to have a ‘regular’ OB appt! Things continued pretty normally for awhile. My regular OB appt went well and everyone was shocked and happy to see that Jameson was still growing like a healthy baby. Another celebration! At 24 weeks I woke up in the middle of the night with horrific back pain. I couldn’t get comfortable. I had been having Braxton Hicks contractions before, but this night they were actually painful and regular – about 4 minutes apart. I went to L&D and was monitored for several hours. My contractions were showing on the monitor and I was 50% effaced. Eventually the contractions slowed down and I was sent home with meds for a UTI. It was a super scary day, but again, something to celebrate. He was still safe and where he needed to be! I hadn’t been very active in the pregnancy to this point, but I started taking it even easier. Monday, November 5, 2018 was a pretty uneventful day. I went to work and relaxed when I got home. I was laying down watching a show when I felt like I peed my pants. I went to the bathroom and a huge gush of fluid came out. I stared in horror as my belly started shrinking right before my eyes. I went to the hospital terrified. Contractions had started and were pretty intense right away. After arriving at the hospital, I was brought to a room quickly and changed into a gown. They put monitors on my belly and had a difficult time finding Jameson’s heartbeat. When they found it, it was going from the 60’s to 80’s. At this point the room was full of doctors and nurses. I had been in the hospital for 10 minutes when I was rushed to the OR for a crash c-section. Jameson was born sleeping at 10:26 pm. 2 pounds, 1.3 ounces and 14 inches long. I was 27 weeks 1 day. While doing the c-section, doctors discovered I had a placental abruption and had a ton of blood in my uterus. If I had been 10 minutes later to the hospital I would have died as well. We stayed in the hospital for 4 days. I was able to keep Jameson with my the entire time. I have hundreds of pictures of him. My family was able to meet and hold him. I gave him a bath. He even pooped on me! 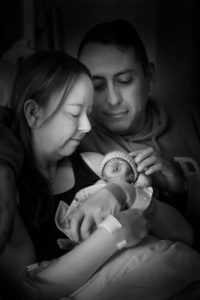 After getting Jameson’s diagnosis, my view of the pregnancy changed. I was determined to celebrate every milestone no matter how small. Each day I had with him was something to celebrate. I had elective ultrasounds done and got as many pictures as I could. I have a heartbeat teddy bear with his beautiful heartbeat recorded. I had maternity photos taken at 25 weeks. I had a baby shower scheduled. I have locks of his hair I keep in a necklace and wear everyday. I read books to him every night. I decided to share my journey on Facebook with friends and family. I did it for me, but was quickly surprised at how quickly news spread around the world and I connected with other families going through the same thing. I also had a friend who was having a high risk pregnancy as well and our friendship grew stronger with our shared experiences. Losing Jameson was the worst thing I have ever gone through. My soul is shattered. He should be with me instead of being my angel in heaven. In the short time I had with him, Jameson taught me so much about life and love. He taught me to not take anything for granted. Life is short. Celebrate everything.